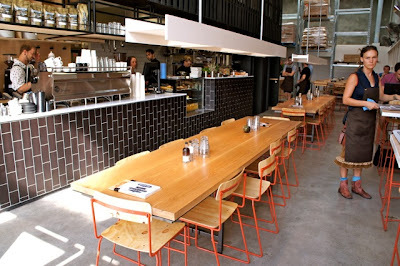 There are two types of café goers in Melbourne: those who go out for coffee and those who go out for food. I’ll unashamedly admit that it’s all about the food for me, but it’s always a pity when a good meal is let down by a bad coffee. 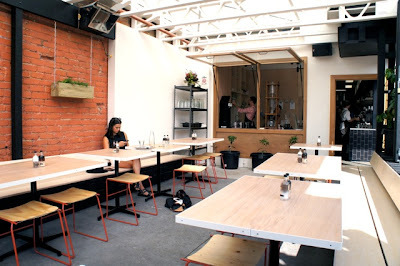 As of yesterday, those with a caffeine problem and those who like to overindulge at brunch time can hold hands and sit in peace at newly opened Industry Beans. 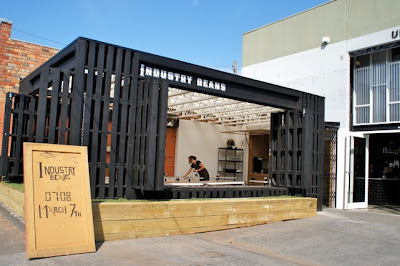 Brought to trendy Fitzroy–in none other than a trendy warehouse space–by the Penny Farthing Espresso brothers (Steven and Trevor Simmons), Industry Beans may well be the best café to hit Melbourne this year. The focus on coffee becomes clear as soon as the bean menu is placed before you: a small bible of varieties that will overwhelm unseasoned coffee drinkers. 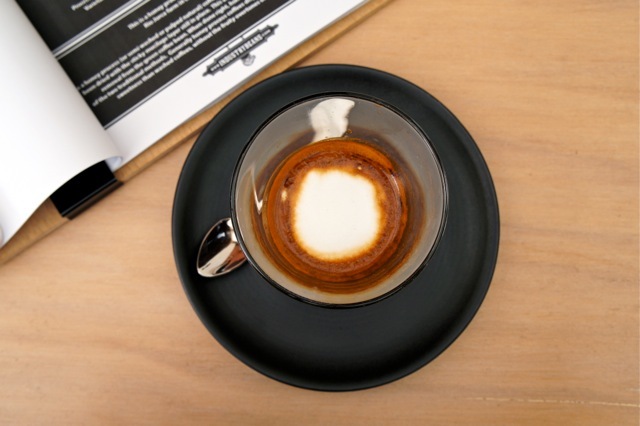 Thankfully, it suggests which bean is suited to which coffee (such as the Costa Rican blend for my long macchiato) and the staff are easygoing and helpful. Industry Beans roast coffee onsite, with the machinery in full view on the way to the bathrooms. The Industry Blend is made up of seasonal origin coffee and there are also limited release single origins. You can buy a bag of beans to take home, but I suggest sitting in the sunny wooden courtyard out the front and enjoying your fill there. Enough about the beans. 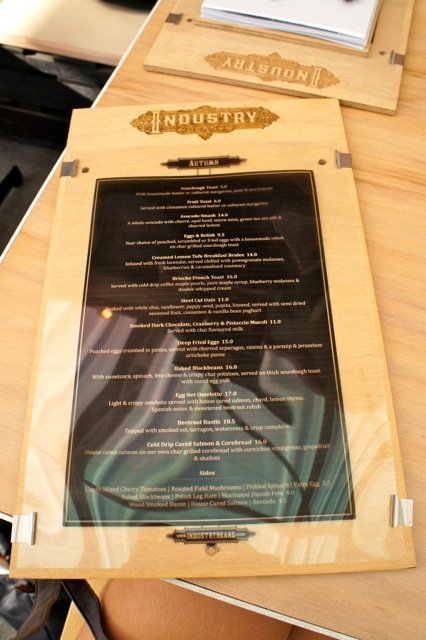 The food at Industry Beans is impressive. It’s not the same old ‘smashed avo menu’ I’ve become so tired of around Melbourne. It’s unique, but still completely approachable. It’s not often I look at a menu and want to try everything on it, but that’s exactly what happened this morning. The result was three breakfasts between two reasonably small women. Our entrée, if you will, was a bowl of the smoked dark chocolate, cranberry and pistachio muesli. It arrived toasted golden and generously spotted with dried cranberries, small shards of dark chocolate and stewed strawberries. 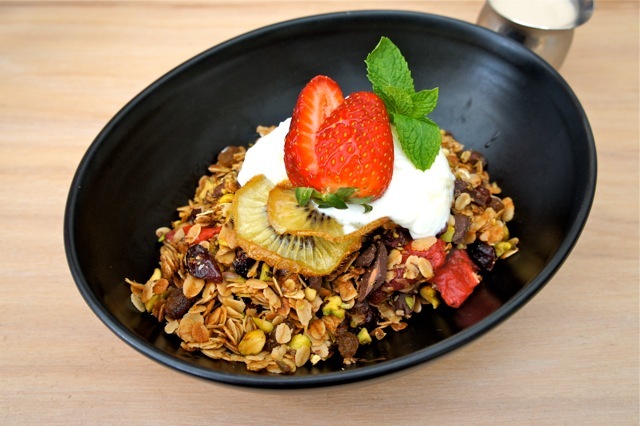 A dollop of Greek yoghurt decorated with slivers of kiwi fruit and a fresh strawberry crowned the dish, but the star ingredient was the chai infused milk. Moving onto our ‘mains’, the egg net omelette I devoured was light and crispy, as described, barely thick enough to hold the salty house cured salmon, chard and thyme. It’s not often salmon is served so liberally, and I was pleasantly surprised. 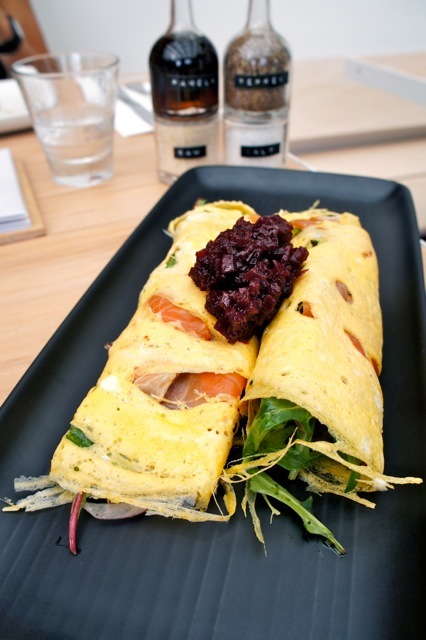 The beetroot relish balanced the omelette, adding a sweet element that countered the saltiness of the salmon. The deep fried eggs were an unpredictably healthy option. 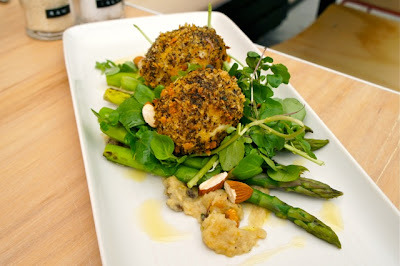 Two panko crumbed spheres rested on a leafy green bed of crunchy charred asparagus, raisins, parsnip and a smooth Jerusalem artichoke purée. Had we not preceded our eggs with muesli, it would have been a lighter option. Other tempting menu items included the brioche French toast with cold drip coffee maple pearls–I repeat, cold drip coffee maple pearls–pure maple syrup, blueberry molasses and double whipped cream; as well as the more savoury beetroot rosti with smoked eel, tarragon, watercress and crisp samphire (an edible coastal plant). The creamed lemon tofu breakfast brûlée infused with lavender and served with pomegranate molasses, blueberries and caramelised rosemary sounded intriguing as well. 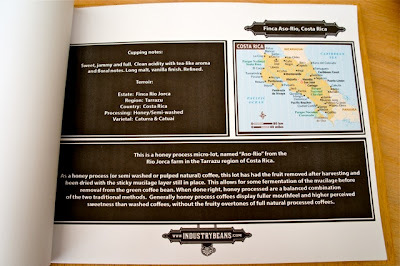 I adored Industry Beans. Maybe it was the sun shining on my back as I caught up with an old friend. Perhaps it was the incredibly helpful waitress who wasn't over the top, just comfortable. Quite possibly it was the refreshing menu and accessible selection of beans. 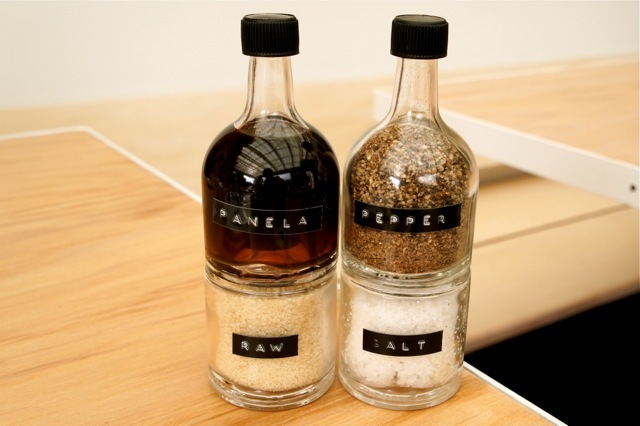 Then again, maybe it was a combination of all of these elements; the ideal recipe for a perfect meal out. Whatever it was, Industry Beans have got it right, and I’m thrilled to have visited before they become swarmed with crowds post Broadsheet and Epicure coverage. I like appearance of this place. 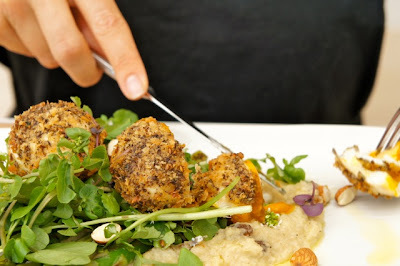 It gives a free feeling and the food looks so yummy. It did have that open feel! One of the advantages about being in a warehouse.